I work in a printing studio of my own in Lund. 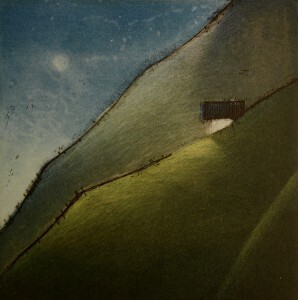 I work with three or four colour aquatint etchings printed from three or four copper plates. I also work with oil paintings, mostly in traditional glazing techniques. The etchings often depicting single objects in a landscape, my paintings mostly representing human beings. I have had more than 200 solo exhibitions in Sweden, Europe and USA.